The medium spiny neuron (MSN) is the major output neuron of the caudate nucleus and uses GABA as its primary neurotransmitter. A majority of MSNs coexpress DARPP-32 and ARPP-21, two dopamine and cyclic AMP-regulated phosphoproteins, and most of the matrix neurons express calbindin. DARPP-32 is the most commonly used MSN marker, but previous attempts to express this gene in vitro have failed. In this study we found that DARPP-32 is expressed in <12% of E13- or E17-derived striatal neurons when they are grown in defined media at high or low density in serum, dopamine, or Neurobasal/N2 (Life Technologies), and ARPP-21 is expressed in <1%. The percentage increases to 25% for DARPP-32 and 10% for ARPP-21 when the same cells are grown in Neurobasal/B27 (Life Technologies) for 7 d. After growth in Neurobasal/B27 plus brain-derived neurotrophic factor (BDNF) for 7 d, E13-derived MSNs are 53.7% DARPP-32-positive and 29.0% ARPP-21-positive; E17-derived MSNs are 66.8% DARPP-32-positive and 51.5% ARPP-21-positive. The percentage of calbindin-positive neurons also is increased under these conditions. Finally, ARPP-21 expression is reduced in mice with a targeted deletion of the BDNF gene. We conclude that BDNF is required for the maturation of a large subset of patch and matrix MSNs in vivo and in vitro. In addition, we introduce a culture system in which highly differentiated MSNs may be generated, maintained, and studied. Neuronal phenotypes are regulated by cell intrinsic and extrinsic factors, but most of the details of the molecular specification of phenotype remain unknown. The caudate nucleus (“striatum”) is a useful model for experimental investigation of neuronal differentiation. It is composed of cells that arise primarily from the lateral ganglionic eminence (LGE) (Deacon et al., 1994; Nakao et al., 1994b), and 95% of the striatal neurons are medium spiny neurons (MSNs). MSNs are morphologically homogeneous, and GABA is their primary neurotransmitter. MSNs may be subclassified, however, by gradients of histogenesis, receptor and neuropeptide expression, and patch or matrix localization (Graybiel, 1990). DARPP-32 ( dopamine and cyclic AMP- regulated phospho protein, 32 kDa) is transcribed in 98% of the MSNs (Gustafson et al., 1992; Ouimet et al., 1998) and is a critical mediator of dopamine function (Fienberg et al., 1998). DARPP-32 is the most commonly used MSN marker. Moreover, return of function by fetal striatal transplants into a lesioned rat caudate correlates with the percentage of the transplant volume that is DARPP-32-positive (Nakao et al., 1996a; Fricker et al., 1997a,b). ARPP-21 is another cyclic AMP-regulated phosphoprotein and third messenger (Girault et al., 1988; Tsou et al., 1993), which is structurally unrelated to DARPP-32 and also highly enriched in MSNs (Ouimet et al., 1989). Calbindin transiently labels patch neurons at birth but ultimately is a marker of a large subset of matrix neurons (Liu and Graybiel, 1992). Because all three proteins are expressed elsewhere in the telencephalon, we define a mature (i.e., differentiated) MSN by the coordinate expression of DARPP-32 and ARPP-21 (Gustafson et al., 1992) and, in the matrix, by calbindin as well. Transplant paradigms suggest that many undifferentiated progenitor cells in the LGE are committed to the MSN phenotype. We demonstrated that, when dissociated rat E14 LGE cells are transplanted into the embryonic brain, most of the surviving neurons reaggregate after migration into the parenchyma. Many of these mitotic, clustered cells differentiate according to their site of origin and ultimately express DARPP-32 and ARPP-21 (Magrassi et al., 1998). A small proportion of the cells integrates in isolation into heterotopic locations where they fail to express DARPP-32 or ARPP-21 (Campbell et al., 1995a; Magrassi et al., 1998). When embryonic day (E) E12.5–E14 LGE cells are transplanted into the adult striatum, 40–90% of the surviving cells express DARPP-32 (Wictorin et al., 1989; Deacon et al., 1994; Campbell et al., 1995b; Olsson et al., 1995, 1998; Fricker et al., 1997a). On the basis of the transplant data, it was anticipated that a large percentage of dissociated progenitor and postmitotic LGE neurons would develop the DARPP-32 phenotype in vitro. Surprisingly, however, under the conditions used to date, <5% of the LGE-derived neurons express DARPP-32 after 1 DIV in defined media (Nakao et al., 1994a,b, 1995, 1996b; Ivkovic et al., 1997); after 5 DIV the total number of DARPP-32-positive cells decreases (Nakao et al., 1994a,b,1995, 1996b). In transplant experiments the cells are exposed to a complete complement of diffusible and contact-mediated factors from the host microenvironment. Therefore, attempts have been made to differentiate MSNs in vitro by the addition of factors that mimic the brain environment. Neurotrophins are such factors, and in the CNS they modulate differentiation and plasticity in postmitotic neurons (Thoenen, 1995). A null mutation in the gene encoding brain-derived neurotrophic factor (BDNF) results in a marked decrease in the striatal expression of calbindin (Jones et al., 1994) and DARPP-32 (Ivkovic et al., 1997). Despite these data, however, the percentage of DARPP-32-positive cells has remained below 5% in the presence of BDNF (Nakao et al., 1994a,b, 1995, 1996b; Ivkovic et al., 1997). In this study we systematically identify the culture conditions under which a majority of MSNs survive but do not phenotypically mature. For the first time we identify basal conditions in which the addition of exogenous neurotrophins leads to the expression of DARPP-32, ARPP-21, and calbindin in up to 70% of the surviving neurons. These data provide definitive evidence that neurotrophins promote the maturation of MSNs. Also, this culture system should provide a valuable approach to the study of isolated, phenotypically mature MSNs. Cell culture. Timed-mated Swiss–Webster mouse dams were anesthetized with pentobarbital (day of plug = E0–E0.5), and the embryos were removed. The meninges were removed, and the LGE (E13 and E15) or the striatum [E17–postnatal day 0 (P0)] was isolated. The tissue was minced with a scalpel blade and incubated in Ca2+/Mg2+-free HBSS (CMF–HBSS) for 8 min at 37°C in a clinical rotator (40 rpm). The incubation mixture was replaced with 0.01% trypsin/CMF–HBSS (E13 and E15) or 2 mg/ml papain (E17 and P0) (Sigma, St. Louis, MO) in CMF–HBSS, incubated for 8 min, and rinsed twice in Leibovitz’s medium (L-15; Life Technologies, Gaithersburg, MD). Then it was suspended in DMEM with 10% fetal calf serum (FCS), glucose (6 mg/ml), glutamine (1.4 mm), and penicillin/streptomycin (100 U/ml). This medium will be referred to as “RF.” Cells were triturated through a glass bore pipette and plated onto Lab-Tek culture dishes coated with polymerized polyornithine (0.1 mg/ml in 15 mm borate buffer, pH 8.4), layered with merosin (2.5 μg/ml) (Life Technologies), and air-dried. Cell death was quantitated by trypan blue exclusion, and the neurons were not plated unless >95% excluded the dye after the dissociation procedure. Then 1 hr later the medium was replaced with defined medium (DM), a mixture of DMEM and F12 with additional insulin, transferrin, selenium (Collaborative Research ITS+ premix, Bedford, MA), and glucose and glutamine, as above, or with Neurobasal/N2 (Life Technologies) or with Neurobasal/B27 (Life Technologies), all with penicillin/streptomycin (100 U/ml). For specific experiments as noted, cells were maintained in serum. In all cases, media, including all additives, were changed every 48 hr. Dose–response curves for neurotrophins were performed for all media, with doses ranging from 1 to 1000 ng/ml. 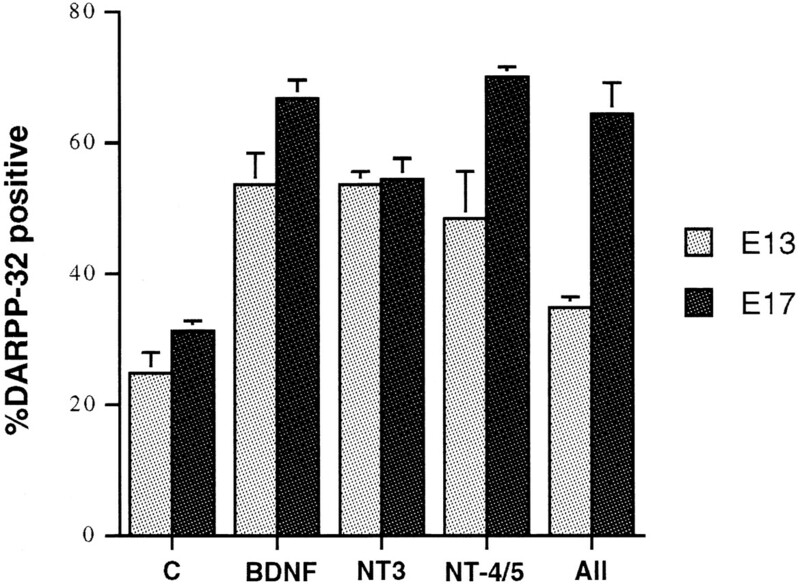 For BDNF, NT-3, and NT-4/5 the maximum responsivity was always seen at 50–100 ng/ml (data not shown). Therefore, unless otherwise indicated, all experiments were performed at 100 ng/ml. Antimitotic agents are added only where indicated because glial growth in B27 is extremely limited (Brewer et al., 1993). BDNF, NT-3, and NT-4,5 were kindly provided by Regeneron (Tarrytown, NY). NGF, GDNF, and CNTF were purchased from Pepro Tech (Rocky Hill, NJ). Immunocytochemistry. Prenatal whole brains or cultures were immersion-fixed in 4% paraformaldehyde in 0.1 m phosphate buffer, pH 7.4, whereas P0 brains were fixed by transcardial perfusion. Then tissue sections (30 μm) or cultures were processed with the appropriate primary and secondary antibodies by using the immunoperoxidase/ABC method (Vector Laboratories Elite Vectastain, Burlingame, CA). Neuronal purity was assessed by staining parallel cultures with neuron-specific enolase (Polyscience, 1:5000). The mouse monoclonal DARPP-32 (6a) and ARPP-21 (6a) antibodies (kindly provided by Drs. H. Hemmings and P. Greengard, Rockefeller University, NY) were used at 1:20,000 and 1:10,000 dilution, respectively. The anti-calbindin, anti-GABA (Sigma) and anti-phospho-ERK (New England Biolabs, Beverly, MA) antibodies were used at 1:1000 dilution. An examination of cultures immunostained with the DARPP-32 and calbindin antibodies revealed obvious, darkly staining neurons and some neurons that may have been stained lightly but were frequently difficult to distinguish from neurons that were unstained. Therefore, we counted only the darkly staining neurons. On the other hand, there was a clear distinction between all immunopositive and immunonegative neurons in cultures stained with the ARPP-21 antibody. Western blot analysis. Proteins were derived from rapidly frozen cultures, eliminating the bias of selected field measurements. Total cellular protein was prepared according to the manufacturer’s instructions (TRIzol; Life Technologies) or by lysis in boiling sample buffer (20% glycerol, 62.5 mm Tris-HCl, pH 6.9, 1% SDS, 5% β-mercaptoethanol, and 0.025% bromophenol blue), followed by sonication, 15 min of centrifugation, and recovery of the supernatants. Western blot analysis with 20–40 μg of protein was performed on 10% SDS-polyacrylamide gels. After transfer to nitrocellulose, the equal loading of proteins was confirmed by Ponceau stain because it was unknown as to whether various treatments would affect levels of “control” proteins, e.g., actin and tubulin. Western blot analysis with the DARPP-32 antibody was performed as previously described (Ehrlich et al., 1990; Ivkovic et al., 1997) and developed with the NEN-DuPont chemiluminescence system (Boston, MA). Quantification and statistical analysis. Total and/or representative neuronal number (enolase+, DARPP-32+, ARPP-21+, or calbindin+) were counted in sister cultures after immunocytochemical staining. Cell counting was performed at 10× or 20× in a premarked grid under phase-contrast. Total cell counts were performed on representative cultures to assess changes accurately in total cell number. To demonstrate that the counting of representative fields does not bias the results, we counted the total number of DARPP-32-positive cells in individual cultures. From E15-derived high-density cultures we counted three wells in DM (2124 ± 140) and three in BDNF (7434 ± 352) after 1 DIV, confirming our previous results from representative fields (Ivkovic et al., 1997). Effects of treatments on cell counts were calculated by the Student’st test, assuming equal variances. All data points represent a minimum of two platings, three fields from each well (i.e., six separate counts), and a minimum of 2000 cells. Results are considered significant if p = 0.05 or less. We examined culture conditions that promote the survival of LGE-derived neurons to determine whether long-term survival in vitro is always accompanied by phenotypic differentiation. We were unable to use the system with which we had begun these studies (Ivkovic et al., 1997) in which plated neurons are exposed to serum for only 1 hr and then switched to a highly defined medium (DM) (Ivkovic et al., 1997). Under these conditions all neurons in E13, E15, E17, and P0 low-density (1 × 105cells/cm2) cultures were dead by 3 DIV. Cell death occurred even in the presence of BDNF, NT-3, and NT-4/5, individually or in combination, at doses from 1 to 100 ng/ml. E13 LGE-derived and E17 striatal neurons survived when they were grown at high density (1 × 106cells/cm2) in DM or at low density in the presence of serum, dopamine, or in the commercial medium Neurobasal with the B27 additive (Life Technologies) (dal Toso et al., 1988; Iacovitti et al., 1999; Brewer, 1995; Nakao et al., 1995). Growth at high density led to neuronal aggregation, but the majority of neurons remained ARPP-21-negative (Fig.1A) and DARPP-32-negative (Fig. 2). In the presence of BDNF, however, many neurons were ARPP-21-positive (Fig.1B), indicating that antibody is able to penetrate the aggregates. BDNF promotes the expression of ARPP-21 in high-density cultures. A, E13-derived neurons plated at 1 × 106 cells/cm2 form large aggregates after 7 DIV but remain ARPP-21-negative.B, Treatment with BDNF (50 ng/ml) for the entire 7 DIV results in a marked increase in ARPP-21 immunopositivity. Magnification, 20×. Neurobasal/B27 promotes the differentiation of a subset of MSNs. The percentage of DARPP-32-positive neurons is increased in E13- and E17-derived low-density (1 × 105 cells/cm2) cultures grown in Neurobasal/B27 in the absence of exogenous growth factors relative to cultures grown at high density, in serum, or in the presence of dopamine. The percentage of DARPP-32-positive cells was calculated after 7 DIV, but the numbers in high-density (HD) cultures are approximate because of the difficulty of counting positive numbers of cells in aggregates. The percentage represents the average of fields from the center and the periphery of the cultures. The percentage in HD (1 × 106 cells/cm2) and in RF (defined medium plus 10% FCS) is greater than in DM plus dopamine (DA) (p < 0.01), and the percentage in Neurobasal/B27 is greater than in HD, RF, FCS or DA (p < 0.001). Under all culture conditions that excluded serum, 90–95% of the surviving cells were positive for neuronal-specific enolase (Fig.3A). This was true even in E17-derived cultures in Neurobasal/B27 in the absence of antimitotic agents. A majority of the neurons were GABA-positive (Fig.3B) (Mizuno et al., 1994; Du et al., 1995). There is a small subpopulation of GABAergic interneurons, representing 1–3% of the striatal neuronal population, which is primarily parvalbumin-positive but always DARPP-32-negative (Smith and Bolam, 1990). Parvalbumin-positive cells were rarely detectable in our cultures, even in the presence of growth factors. Representative E13- and E17-derived neurons cultured in Neurobasal/B27 and plated at 1 × 105 cells/cm2. A,E17-derived neurons, immunostained for neuron-specific enolase, after 1 DIV. B, E17-derived neurons, immunostained for GABA, after 1 DIV. C, D, E13-derived neurons stained for phospho-ERK in the absence (C) or presence (D) of BDNF (100 ng/ml) for 30 min.E–G, E17-derived neurons immunostained for DARPP-32 after 1 DIV in the absence of BDNF (E), after 7 DIV in the absence of BDNF (F), and after 7 DIV in the presence of BDNF (100 ng/ml) (G). Note the marked increase in soma size over time as induced by Neurobasal/B27 alone and further induced by the presence of BDNF. H, E13-derived neurons immunostained for ARPP-21 after 1 DIV in the presence of BDNF.I, J, E17-derived neurons stained for ARPP-21 after 7 DIV in the absence of BDNF (I) and after 7 DIV in the presence of BDNF (100 ng/ml) (J).K–M, E17-derived neurons immunostained for calbindin after 1 DIV in the absence of BDNF (K), 7 DIV in the absence of BDNF (L), and 7 DIV in the presence of BDNF (M). Magnification, 40×; scale bar, 30 μm. We determined the percentage of DARPP-32- or ARPP-21-positive cells under all culture conditions at 7 DIV in the absence of neurotrophins (see Fig. 2). 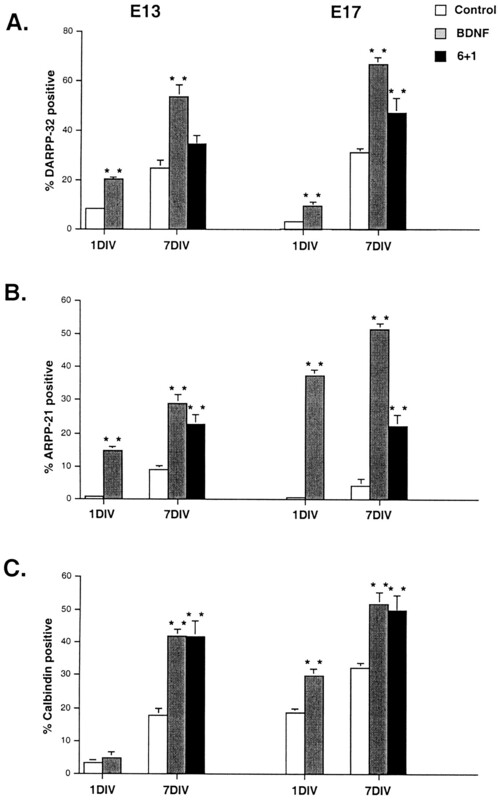 The percentage of DARPP-32-positive cells did not exceed 10% in high-density (HD) cultures and in low-density cultures grown in the presence of serum (RF) or dopamine (DA). In Neurobasal/B27 the percentage of DARPP-32-positive neurons exceeded 25% in both E13 and E17 cultures after 7 DIV in the absence of neurotrophins. ARPP-21 immunoreactivity, however, was detectable only in a very small percentage of neurons in Neurobasal/B27 cultures after 7 DIV and was very light (Fig. 3I). Approximately 50% of E13-derived cells survived for 7 DIV in Neurobasal/B27, and ∼25% of E17-derived neurons survived, similar to that reported by Brewer (1995). There are additives in B27 that may promote both survival and differentiation, including retinyl acetate, steroids, and thyroid hormone (Brewer et al., 1993). All of the additives together, however, apparently are unable to induce the majority of striatal progenitors to express a mature MSN phenotype. We next asked whether BDNF would stimulate medium spiny neuron progenitors grown in the presence of Neurobasal/B27 to express a mature phenotype, as defined by the expression of both DARPP-32 and ARPP-21. In the presence of BDNF (Table 1; Fig.4A) the percentage of DARPP-32-positive neurons in E13 Neurobasal/B27 cultures rose from 8.6 to 20.6% after 1 DIV. In E17-derived cultures, it increased from 3.4 to 10.3% (Fig. 3E). After 7 DIV, E13 cultures in Neurobasal/B27 were 25% DARPP-32-positive; with the addition of exogenous BDNF for the entire 7 DIV, almost 54% were DARPP-32-positive. E17 cultures were almost 70% DARPP-32-positive in the presence of BDNF for 7 d but only 29% in its absence (Figs.3F,G, 4A). In the presence of BDNF for 1 DIV, E13 and E17 cultures were 14.6 and 36% ARPP-21-positive (Figs.3J, 4B), respectively. The percentage of ARPP-21-positive cells at 7 DIV in the presence of BDNF increased even further in both E13 and E17 cultures (Table 1). Therefore, BDNF is required for ARPP-21 expression in vitroeven more so than that for DARPP-32. The percentage of DARPP-32- (A), ARPP-21- (B), and calbindin-positive (C) neurons increases in E13- and E17-derived cultures grown in the presence of BDNF. 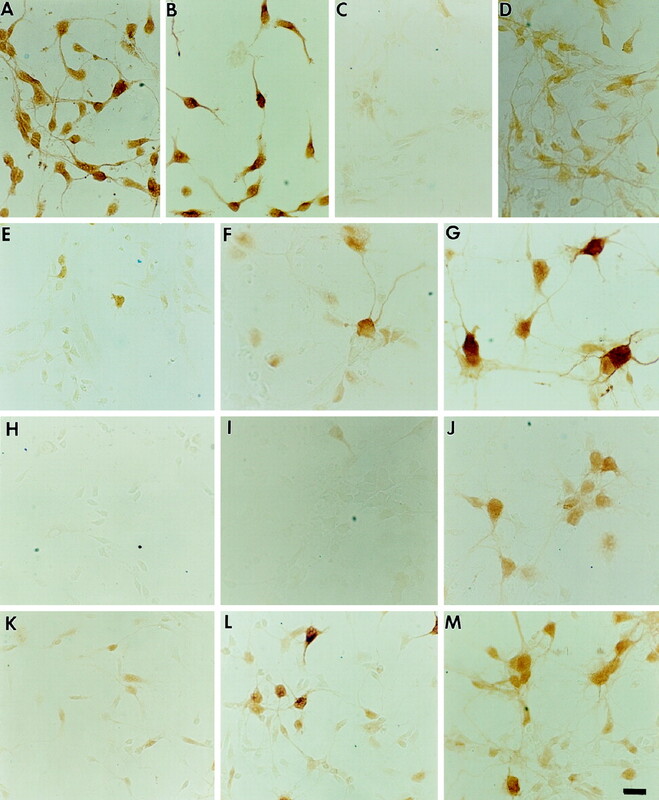 Neurons were cultured in Neurobasal/B27 (Control) alone for 1 or 7 d, in Neurobasal/B27 with the addition of 100 ng/ml BDNF for 1 or 7 d, or in Neurobasal/B27 for 6 d, followed by Neurobasal/B27 plus 100 ng/ml BDNF for day 7 (6+1). BDNF and 6+1 values were compared with control values in the same category. **All were significant at p < 0.001, except for E13/6+1 for DARPP-32 and E13/1 DIV for calbindin, which were not significant. To eliminate potential bias from counting representative fields, we also performed Western analysis of DARPP-32 protein derived from scaled-up sister cultures. DARPP-32 protein was increased in E13 cultures in the presence of BDNF at both 1 and 7 DIV, as compared with cultures grown in Neurobasal/B27 alone (Fig.5A). These blots also confirmed the increase in total DARPP-32 protein per culture in E15-, E18-, and P0-derived cultures after 1 DIV in the presence of BDNF (Fig.5B). Western blot analyses of DARPP-32 protein in samples derived from whole cultures correlate with the numbers of percentage-positive neurons derived from selected field counts.A, Western blot analysis of DARPP-32 protein in E13-derived sister cultures maintained in Neurobasal/B27 with or without BDNF for 1 and 7 DIV. 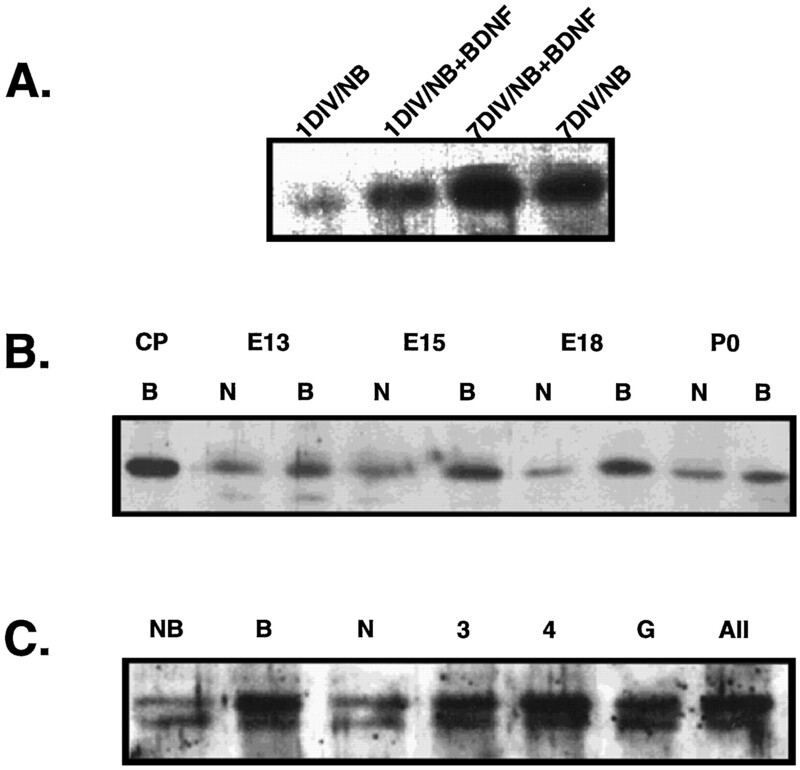 B, BDNF increases the amount of DARPP-32 protein in E13-, E15-, E18-, and P0-derived cultures after 1 DIV. CP, Control caudate putamen, 5 μg from adult mouse; N, Neurobasal/B27; B, Neurobasal/B27 plus BDNF, 100 ng/ml. C, NT-3 and NT-4/5, alone or in combination with BDNF, increase the amount of DARPP-32 protein in E13-derived cultures to the same extent as does BDNF alone. NFG does not increase DARPP-32 protein in sister cultures. The results with GDNF were somewhat variable, and this experiment is one in which GDNF increased the amount of DARPP-32 protein, but not the percentage of immunostained cells. All cultures included Neurobasal/B27 (NB). B, BDNF; N, NGF;3, NT-3; 4, NT-4/5; G, GDNF; All, BDNF, NT-3, and NT-4/5, each at 25 ng/ml. Neuronal survival rate at 1 DIV is >90% in E13 and E17 cultures in Neurobasal/B27 (Brewer, 1995). The increase in DARPP-32- and ARPP-21-immunopositive neurons at 1 DIV in the presence of BDNF therefore almost certainly is caused by the induction of gene expression, which is first detectable after 12 hr in E15-derived cultures (Ivkovic et al., 1997). Neuronal number was the same in sister cultures with or without BDNF at 7 DIV (p < 0.1). There are at least four alternative explanations, which are not mutually exclusive, for the increase in the percentage of DARPP-32- and ARPP-21-positive neurons from 1 to 7 DIV in the presence of BDNF. The first is that there is further de novo induction of gene expression as cells become postmitotic and mature. The second is that there is selective survival of those neurons that already are committed to an MSN phenotype. The third is that there is increased proliferation of a subset of progenitors that are fated to be DARPP-32/ARPP-21-positive. The fourth is that BDNF induces multipotential progenitors to assume an MSN phenotype rather than some other phenotype. In view of (1) the large effect of BDNF, particularly in regard to ARPP-21, (2) the absence of increased cell number, attributable either to survival or mitosis, in the presence of BDNF, (3) the results of experiments indicating that up to 90% of dissociated E13 LGE cells assume the MSN phenotype after transplant, and (4) the absence of large numbers of DARPP-32-positive neurons in LGE cells cultured under other conditions (Nakao et al., 1994a,b, 1995,1996b), we favored the first interpretation. We therefore sought to determine whether exposure to BDNF for only 24 hr results in an increase in DARPP-32, ARPP-21, and calbindin expression in neurons that already have been in culture for 6 DIV (see Table 1; Fig. 4). In E13 cultures DARPP-32 immunopositivity tended to rise from 25 to almost 32%, but this increase did not reach statistical significance. In 6 DIV E17 cultures, however, the percentage of DARPP-32-positive cells rose from 29.3 to 47.3% (p < 0.001). For ARPP-21 immunopositivity the percentage in E13 cultures rose from 9.9 to 21% (p < 0.001) and, in E17 cultures, from 4.4 to 22.3% (p < 0.001) in the presence of BDNF. Calbindin immunopositivity doubled (p < 0.001), reaching the same level as in cultures that were in BDNF for the entire 7 d. The fact that DARPP-32 and ARPP-21 immunopositivity did not reach the same levels as achieved after a full 7 DIV in the presence of growth factor may indicate that the maturation process and successive gene expression require >24 hr, depending on the stage of the cell. It is also possible that there is a subset of progenitor cells that are induced to proliferate and express DARPP-32 and ARPP-21, but not calbindin. If this were the case, however, there likely would be a significant increase in total neuronal number in the presence of BDNF, which did not occur. Because BDNF does not have a measurable mitotic effect on a mix of striatal progenitors (Ventimiglia et al., 1995), a selective mitotic and inductive effect may account for only a small percentage of the increase in DARPP-32 and ARPP-21 immunopositivity. Previous studies examining the DARPP-32 phenotype in MSNs in dissociated culture after exposure to neurotrophins used a system in which the cells remained in serum for 24 hr (Nakao et al., 1994a,b,1995, 1996b). We therefore varied the exposure time to serum. The induction of DARPP-32 by BDNF in E13 and E17 cultures occurs if the cells are never exposed to serum (triturated and plated in Life Technologies Neurobasal/N2 or B27), exposed to serum for the time of trituration and for 1 hr after plating and then transferred to Neurobasal/B27, or cultured in serum for up to 1 week (data not shown). Therefore, unknown factors in serum do not inhibit the effects of BDNF, and if the serum contains any BDNF, it is insufficient for maximal DARPP-32 induction. Finally, we sought to determine the specificity of the response to BDNF. We first investigated whether all neurons in LGE-derived cultures that are BDNF-responsive express DARPP-32 in its presence. In E13-derived cultures >90% of the neurons at 1 DIV are responsive to BDNF, as determined by the immunodetection of phospho-ERK after 30 min of exposure to BDNF (see Fig. 3C,D). After 24 hr of exposure to BDNF, however, only 20.6% of the neurons are DARPP-32-positive and, after 7 DIV, 53.7%. Therefore, expression of DARPP-32 may require BDNF and, in a subset of MSNs, other unidentified factors. Cultures from the lateral ganglionic eminence also contain GABAergic cells that in vivo ultimately populate the cortex (Anderson et al., 1997b). As would be expected from the known distribution of the DARPP-32 protein, cortical cultures contain a low percentage of DARPP-32-positive cells. Cortical neurons both produce and respond to BDNF (Ghosh et al., 1994;Altar et al., 1997). However, we were unable to find any conditions under which BDNF induced DARPP-32 in E15 cortical cultures beyond 1–2% of the total (data not shown). Together, these data imply that the nature of the telencephalic neuronal response to BDNF is preprogrammed. When we extrapolate to the mouse from studies performed in the rat (van der Kooy and Fishell, 1987), a majority of LGE neurons born at E13 become part of the striatal patch, whereas by E17 newborn striatal neurons in large part become part of the matrix. Calbindin is expressed primarily in matrix neurons in the adult (Graybiel, 1990). Mice with a null mutation in the BDNF gene express very little calbindin in the striatum (Jones et al., 1994), but these data do not discriminate between selective gene regulation in the matrix and selective regulation of the calbindin gene. We therefore sought to determine whether or not calbindin could be used in vitro to distinguish cell cultures representing patch and matrix compartments. We hypothesized that E13-derived cultures should contain fewer calbindin-positive cells than E17-derived cultures, particularly at 1 DIV. E17-derived cultures would be expected to contain most of the patch neurons (if they survived the dissociation and plating procedure) and a majority of matrix neurons, as are present in the adult striatum. We found that, in Neurobasal/B27 without exogenous growth factors, E13 cultures were <3% calbindin-positive at 1 DIV and 17% positive at 7 DIV. E17 cultures were almost 19% calbindin-positive at 1 DIV and almost 32% positive at 7 DIV (see Fig. 3K–M). In the presence of BDNF for 1 DIV, the number in the E13 cultures did not increase, whereas it almost doubled in E17 cultures (see Fig.4C). These numbers are in contrast to the percentage of DARPP-32-positive neurons, which is higher in E13 than in E17 at 1 DIV. These data imply that the cultures are not distinguished solely on the basis of their overall well being and/or maturity. By 7 DIV in the presence of BDNF the percentage of calbindin-positive cells was higher (p = 0.01; Student’s t test) in E17 than in E13 cultures. The calbindin-positive neurons in the E13 cultures also may, to some extent, represent patch neurons that transiently express this protein (Liu and Graybiel, 1992). Thus, E17-derived cultures appear to represent the matrix compartment to a greater extent than do E13-derived cultures. In this regard, then, we conclude that BDNF promotes maturation of both patch and matrix striatal neurons. This interpretation is supported further by the increase in DARPP-32 protein in P0 cultures treated with BDNF (Fig.5B). On the basis of an analysis of BDNF−/− mice, we concluded that BDNF is required for phenotypic maturation of a subset of MSNs. Because DARPP-32 is transcribed in BDNF−/− mice and some MSNs even stain as darkly as those in the wild type (Ivkovic et al., 1997), we anticipated that other factors play a role. Likewise, in vitro there is a subset of MSNs that express DARPP-32 in the absence of BDNF. Previous studies in vitro have demonstrated that NT-3 and NT-4/5 promote differentiation of the GABAergic phenotype (Mizuno et al., 1994; Widmer and Hefti, 1994; Ventimiglia et al., 1995). As with BDNF, single studies examining the effects of NT-3 and NT-4/5 on the DARPP-32 phenotype have reported that <5% of the neurons are DARPP-32-positive (Nakao et al., 1996b). We examined the ability of these other neurotrophins to promote MSN differentiation in our system, as determined by the expression of DARPP-32. We found that NT-3 and NT-4/5 also increase the number of DARPP-32-positive cells in E13 and E17 cultures after 1 DIV and even more so in both ages after 7 DIV (Fig.6). NGF, CNTF, and GDNF do not increase the percentage of DARPP-32-positive cells after 1 or 7 DIV, although GDNF sometimes did appear to increase the DARPP-32 content of the total culture (see Fig. 5C). These results are consistent with other studies that analyzed the in vitro effects of NGF (Mizuno et al., 1994; Ventimiglia et al., 1995; Nakao et al., 1995,1996b). NT-3 and NT-4/5, alone or in combination with BDNF, increase the number of DARPP-32-positive neurons to the same extent as does BDNF alone in both E13- and E17-derived cultures after 7 DIV. When used individually, growth factor concentrations were 100 ng/ml. In All, which contained BDNF, NT-3, and NT-4/5, the concentration of each neurotrophin was 10 ng/ml in E17, and 25 ng/ml in E13. All values are significant relative to control atp <0.001, except for E13-derived cultures in all neurotrophins at 7 DIV (p < 0.01). In situ hybridization studies have demonstrated the presence of both trkB and trkC transcripts in the striatum (Ernfors et al., 1992; Alvarez-Dolado et al., 1994; Escandon et al., 1994; Jung and Bennett, 1996), but it is not known whether the receptors are coexpressed in neurons. We therefore sought to determine whether the effects of the neurotrophins were additive. We found that there is a ceiling effect at both ages; however, submaximal doses of the growth factors are additive in achieving this ceiling level (Figs.5C, 6). In other words, the maximum percentage of DARPP-32-positive neurons was identical with BDNF alone or with all three neurotrophins, but this number could be achieved with 10 ng/ml (E17) or 25 ng/ml (E13) of each growth factor when the three were combined. A higher concentration of neurotrophins may be required in the E13 cultures because of a relatively lower level of receptors and/or components of the intracellular signal transduction system.In vivo, however, NT-3 clearly does not substitute for BDNF, perhaps because of different temporal and spatial distributions. Our preliminary results indicating that DARPP-32 immunostaining is normal in PO NT-3−/− mice are consistent with these data (M. Ehrlich and I. Farinas, unpublished observations). We have established previously that DARPP-32 and ARPP-21 mRNAs are transcribed coordinately in most MSNs (Gustafson et al., 1992), but the two proteins are unrelated structurally (Kurihara et al., 1989) and therefore not members of a gene family. We also have sought to determine whether the two genes are regulated similarly during development in vivo. ARPP-21 mRNA transcripts increase in MSNs during the first 2 weeks postnatal, but we were unable to detect ARPP-21 mRNA by using in situ hybridization with oligonucleotide probes in the embryo (Gustafson et al., 1992). In this study we examined the ontogeny of ARPP-21 by immunocytochemistry. ARPP-21 is detected first on E18 (Fig.7A), 5 d after DARPP-32 (Foster et al., 1988). Its expression may be initiated later than DARPP-32, or early levels are below our limits of detection. On the day of birth, similar to DARPP-32, ARPP-21 is found in patch-like structures (Fig. 7B). Like DARPP-32, ARPP-21 immunoreactivity is decreased in BDNF−/− mice at P0 relative to wild-type littermate controls (Fig. 7C). When compared within vitro data, these in vivo data indicate that neurotrophins do not induce premature differentiation, implying that LGE progenitors may have an intrinsic timetable that requires extracellular factors for implementation. ARPP-21 expression is decreased in BDNF−/− mice.A, ARPP-21 expression is first detectable in wild-type mice on E18. Note that the immunoreactivity is present in loose patch-like structures. B, There are increased numbers of more highly defined ARPP-21 immunoreactive patches on the day of birth when immunoreactivity is also present in the neuropil.C, ARPP-21 immunoreactivity is reduced on the day of birth in mice with a targeted deletion of the BDNF gene. Magnification 40×; scale bar, 40 μm. We demonstrate that in vitro maturation of a large subset of striatal medium-sized spiny neurons, as defined by the expression of the DARPP-32, ARPP-21, and calbindin phenotype, requires neurotrophins. DARPP-32 and ARPP-21 transcription is initiated only in postmitotic, postmigrational MSNs (Foster et al., 1988; Gustafson et al., 1992). In vivo, GABA expression is apparent earlier than is that of DARPP-32 and ARPP-21 (Lauder et al., 1986) and therefore marks a more immature neuron. At P0, DARPP-32 is a marker of patch neurons (Anderson et al., 1997a), and we now show that ARPP-21 marks the same compartment in the newborn mouse. We previously demonstrated that DARPP-32 and ARPP-21 transcripts increase simultaneously from P0 to P14 regardless of the age or location of the MSN, which suggested that extracellular factor(s) regulate maturation (Gustafson et al., 1992). Transneuronal dopaminergic signals regulate the transcription of several genes in MSNs (Graybiel, 1990; Xu et al., 1994), but neonatal or adult 6-hydroxydopamine lesions and targeted deletions of the D1 receptor do not alter DARPP-32 or ARPP-21 steady-state mRNA or protein levels (Ehrlich et al., 1990;Ehrlich and Greengard, 1991; Xu et al., 1994). These data prompted us to search for other regulators of MSN phenotype. Recognizing that an in vivo versus in vitrocomparison is not entirely accurate, we performed calculations to generate predictions of cell-type contents depending on the age of the embryo source of neurons. The striatum is composed of two neuronal compartments, the patch (or striosomes) and matrix (Graybiel, 1990). Patch cells ultimately comprise ∼15% of striatal neuronal volume. In the rat, 80% of MSNs born on E14.5 become patch cells, whereas only 20% of cells born on E20 become patch neurons (van der Kooy and Fishell, 1987). We equate a rat E14.5 embryo to a mouse E13 embryo. Thus, ∼80% of MSNs born on mouse E13 will reside in the patch, and these should constitute the only DARPP-32-positive neurons in the newborn mouse striatum. The newborn mouse striatum is thein vivo age-equivalent of the E13-derived cultures after 7 DIV. Therefore, a maximum of 80% of E13-derived cultures should be DARPP-32-positive after 7 DIV. In the presence of BDNF the E13-derived neurons are 54% DARPP-32-positive after 7 DIV. E17-derived striatal cultures at 7 DIV should contain almost 100% MSNs, as does the P5 mouse striatum (Foster et al., 1988; Gustafson et al., 1992). 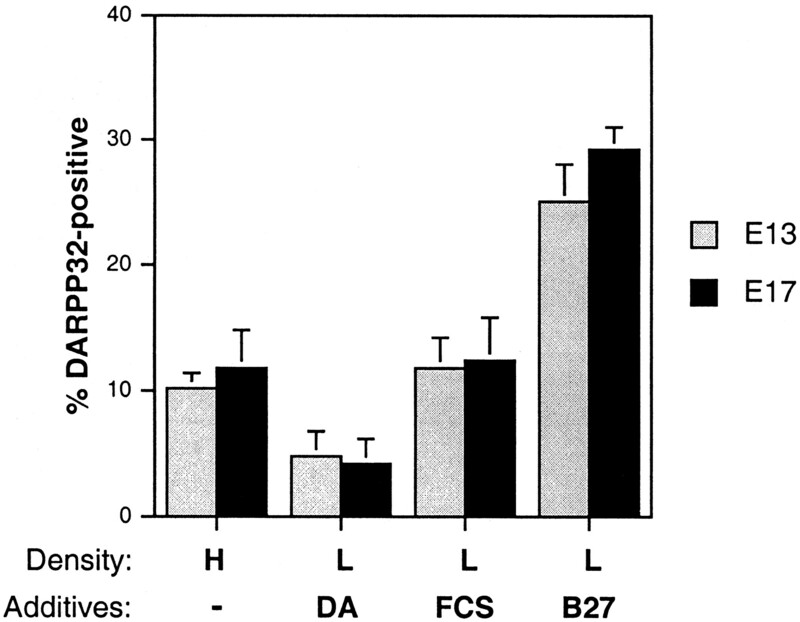 E17-derived cultures are almost 70% DARPP-32-positive after 7 DIV in the presence of BDNF. Our results differ significantly from other published data in which the percentage of DARPP-32-positive neurons in BDNF-treated rat LGE-derived neurons (mitotic and postmitotic) never exceeded 5% (Nakao et al., 1994a,b, 1995, 1996b) and the percentage of calbindin neurons in cultures derived from E18–E19 rat striatum remained below 25% (Mizuno et al., 1994). The enhanced maturation of MSNs in our cultures likely may be attributed to the culture conditions having differed in several aspects in addition to the cells having been derived from different species. Both Mizuno et al. (1994) and Nakao et al. (1994a,b, 1995,1996b) stabilized their neurons in serum-containing medium for 24 hr before changing to a defined medium very similar to our DM. In our related study with only 1 hr of stabilization in serum, all cells were dead after 3 DIV. In the study by Mizuno et al. (1994), cell death was minimal for the next 5 d in serum-free medium, but only 80% of the cells were NSE-positive. In the second set of studies (Nakao et al., 1994a,b, 1995, 1996b) 24 hr exposure to serum apparently promoted survival of ∼50% of the neurons in low-density cultures for up to 5 d, at which time the DARPP-32-positive neurons were counted and found to constitute <2% of surviving neurons. In fact, regardless of which growth factor was applied, Nakao et al. (1994a,b,1995, 1996b) found that the total number of DARPP-32 neurons always decreased with time. It is possible, therefore, that the neuronal subtype that survived under these conditions did not include progenitors or postmitotic neurons committed to the DARPP-32 phenotype and could not be induced to express DARPP-32 under any conditions. The Neurobasal/B27 medium apparently provides optimal basal conditions for differentiation but also may have favored the survival of progenitors committed to the MSN phenotype. We consider this latter explanation unlikely, however, because we were able to induce DARPP-32 expression in high-density and serum-containing cultures in which a majority of cells survive. Are the in vitro results of this study consistent with thein vivo observations? In mice with a targeted deletion of the BDNF gene, there is almost no detectable striatal calbindin (Jones et al., 1994). Therefore, it is somewhat surprising that our cultures have a fairly high number of calbindin-positive neurons in the absence of exogenous BDNF. There are several possible explanations. First, exposure to BDNF in vivo before removal of the embryos may be sufficient to initiate this part of the MSN developmental program. Second, the cultures may contain low levels of endogenous BDNF sufficient for the induction of calbindin expression. Because the LGE is known to give rise to some cortical neurons (De Carlos et al., 1996;Anderson et al., 1997b) and there may be a low level of contamination with cortical neurons after even the most careful of dissections, some of the GABA-positive, DARPP-32-negative neurons actually may be cortical BDNF-positive neurons (Friedman et al., 1991; Altar et al., 1997; Conner et al., 1997). Also, the B27 additive may contain a higher level of a calbindin-inducing substance than that to which the cells are exposed in vivo. These explanations also may account to some extent for the subset of MSNs in vitro that express DARPP-32 in the absence of BDNF. However, it is important to note that, unlike calbindin expression, there is striatal DARPP-32 expression in BDNF−/− mice, although it is much lower than in the wild type at P0 (Ivkovic et al., 1997). Finally, BDNF appears to be most critical for ARPP-21 expression in vitro. This study further highlights the heterogeneity of the MSN population: not only is there a multitude of MSN subtypes, but the same gene may be regulated differentially. There is a subset of MSNs that manifest the DARPP-32 phenotype in the absence of BDNF, and our data further suggest that there is another subset of MSNs that are DARPP-32-negative even in the presence of BDNF. It is highly likely that there are factors other than those in the neurotrophin family that regulate MSN maturation. For example, D2 and D1receptor expression is highly responsive to retinoids, and this regulation varies regionally within the striatum (Krezel et al., 1998;Valdenaire et al., 1998). We also found that, although B27 contains retinyl acetate, the addition of all-trans-retinoic acid increases the percentage of DARPP-32-positive cells, but not to the same level as does BDNF (our unpublished observations). The origin of BDNF within the striatum remains controversial. Several studies have demonstrated the presence of BDNF mRNA in the striatum (Hofer et al., 1990; Okazawa et al., 1992; Miranda et al., 1993;Alvarez-Dolado et al., 1994; Schmidt-Kastner et al., 1996). Recently, however, the preponderance of evidence indicates that the BDNF in the adult striatum arrives by anterograde transport from the cortex (Altar et al., 1997; Conner et al., 1997). It has not been excluded, however, that embryonic MSNs might produce BDNF. Patch architecture and phenotype is first evident in the mouse at E18–E19 (Foster et al., 1988). This timing coincides with the earliest detection of corticostriate collaterals (Hattori and McGeer, 1973; Fentress et al., 1981; Sheth et al., 1998) and may be related causally to the expression of DARPP-32 and ARPP-21. Because there are neurons that fail to express DARPP-32 in the presence of BDNF in vitro, it is possible that coordination with glutamatergic input from cortical cells may be required. A precedent has been established for dual neurotransmitter/neurotrophin regulation of maturation and cell death elsewhere in the CNS (Morrison and Mason, 1998). The molecular mechanism of DARPP-32 and ARPP-21 induction by BDNF also remains to be determined. The nuclear effectors that correlate best with trk-mediated transcription are CREB andc-fos (Segal and Greenberg, 1996). Dopamine also leads to increases in levels of phosphorylated CREB and c-fos(Konradi et al., 1993). Their failure to regulate DARPP-32/ARPP-21 transcription implies that CREB and c-fos are not solely responsible for the BDNF effect on the phosphoprotein genes. In addition, we have not identified either AP-1 or CRE elements in either the DARPP-32 or ARPP-21 promoter (Blau et al., 1995; Ivkovic et al., 1996). It is possible, however, that CREB and c-fos may induce yet-to-be-identified factors that in turn regulate DARPP-32 and ARPP-21 transcription. This would be consistent with our data that DARPP-32 protein is not increased until >6 hr of BDNF stimulation (Ivkovic et al., 1997), whereas c-fos induction and CREB phosphorylation occur within minutes (Ghosh and Greenberg, 1995). In addition to defining the role of BDNF in the differentiation of the medium-sized spiny neuron, this study introduces a culture system in which highly differentiated MSNs may be generated, maintained, and studied. It is now clear that expression of the GABAergic phenotype and profound morphological differentiation are insufficient criteria by which to label an LGE-derived neuron as a medium-sized spiny neuron. Currently, we are extending our analysis to delineate further the neuronal subtypes present in our cultures as determined by receptor and neuropeptide expression. These data are particularly pertinent to any attempts to use cultured MSNs for physiological studies and/or in vitro analyses of toxins and therapeutic agents and strategies. This study was supported by grants from the National Institute of Mental Health, Hereditary Disease Foundation, and Irma T. Hirschl Trust. We are indebted to Dr. Olga Polonskaia for technical assistance and to Dr. Suzana Petanceska for help with the preparation of figures. Correspondence should be addressed to Dr. Michelle E. Ehrlich, The Nathan Kline Institute, 140 Old Orangeburg Road, Orangeburg, NY 10962. (1997) Anterograde transport of brain-derived neurotrophic factor and its role in the brain. Nature 389:856–860. (1994) Expression of neurotrophins and the trk family of neurotrophin receptors in normal and hypothyroid rat brain. Mol Brain Res 27:249–257. (1997a) Mutations of the homeobox genes DLX-1 and DLX-2 disrupt the striatal subventricular zone and differentiation of late-born striatal neurons. Neuron 9:27–37. (1997b) Interneuron migration from basal forebrain to neocortex: dependence on Dlx genes. Science 278:474–476. (1995) DARPP-32 promoter directs transgene expression to renal thick ascending limb of loop of Henle. Am J Physiol 269:F564–F570. (1995) Serum-free B27/Neurobasal medium supports differentiated growth of neurons from the striatum, substantia nigra, septum, cerebral cortex, cerebellum, and dentate gyrus. J Neurosci Res 42:674–683. (1995a) Regional incorporation and site-specific differentiation of striatal precursors transplanted to the embryonic forebrain ventricle. Neuron 15:1259–1273. (1995b) Neurotransmitter-related gene expression in intrastriatal striatal transplants. I. Phenotypical characterization of striatal and non-striatal graft regions. Neuroscience 64:17–33. (1997) Distribution of brain-derived neurotrophic factor (BDNF) protein and mRNA in the normal adult rat CNS: evidence for anterograde axonal transport. J Neurosci 17:2295–2313. (1988) Development and survival of neurons in dissociated fetal mesencephalic serum-free cell cultures. I. Effects of cell density and of an adult mammalian striatal-derived neuronotrophic factor (SDNF). J Neurosci 8:733–745. (1994) The lateral ganglionic eminence is the origin of cells committed to striatal phenotypes: neural transplantation and developmental evidence. Brain Res 668:211–219. (1996) Dynamics of cell migration from the lateral ganglionic eminence in the rat. J Neurosci 16:6146–6156. (1995) Brain-derived neurotrophic factor works coordinately with partner molecules to initiate tyrosine hydroxylase expression in striatal neurons. Brain Res 68:229–233. (1991) Rat ARPP-21 mRNA: sequence analysis, tissue distribution, and ontogeny. J Neurochem 57:1985–1991. (1990) DARPP-32 development in the caudate nucleus is independent of afferent input from the substantia nigra. Dev Brain Res 54:257–263. (1992) Cells expressing mRNA for neurotrophins and their receptors during embryonic rat development. Eur J Neurosci 4:1140–1158. (1994) Regulation of neurotrophin receptor expression during embryonic and postnatal development. J Neurosci 14:2054–2068. (1981) Observations on the development of the striatum in mice and rats. Anat Embryol (Berl) 163:175–298. (1998) DARPP-32: regulator of the efficacy of dopaminergic neurotransmission. Science 281:838–843. (1988) Ontogeny of the dopamine and cyclic adenosine-3′,5′-monophosphate-regulated phosphoprotein (DARPP-32) in the pre-and postnatal mouse central nervous system. Int J Dev Neurosci 6:367–386. (1997a) The effects of donor stage on the survival and function of embryonic striatal grafts in the adult rat brain. I. Morphological characteristics. Neuroscience 79:695–710. (1997b) The effects of donor stage on the survival and function of embryonic striatal grafts in the adult rat brain. II. Correlation between positron emission tomography and reaching behaviour. Neuroscience 79:711–721. (1991) Cells that express brain-derived neurotrophic factor mRNA in the developing postnatal rat brain. Eur J Neurosci 3:688–697. (1995) Distinct roles for bFGF and NT-3 in the regulation of cortical neurogenesis. Neuron 15:89–103. (1994) Requirement for BDNF in activity-dependent survival of cortical neurons. Science 263:1618–1623. (1988) Regulation by cAMP and vasoactive intestinal peptide of phosphorylation of specific proteins in striatal cells in culture. Proc Natl Acad Sci USA 85:7790–7794. (1990) Neurotransmitters and neuromodulators in the basal ganglia. Trends Neurosci 13:244–254. (1992) In situ hybridization analysis of the development of DARPP-32 and ARPP-21 in rat striatum. Neuroscience 51:65–75. (1973) Synaptogenesis in the corpus striatum of infant rat. Exp Neurol 38:70–79. (1990) Regional distribution of brain-derived neurotrophic factor mRNA in the adult mouse brain. EMBO J 9:2459–2464. (1999) Neurotransmitter, KCl, and antioxidants rescue striatal neuron from apoptotic cell death in culture. Brain Res 816:276–285. (1996) ARPP-21: murine gene structure and promoter identification of a neuronal phosphoprotein enriched in the limbic striatum. Brain Res 709:10–16. (1997) Brain-derived neurotrophic factor regulates maturation of the DARPP-32 phenotype in striatal medium spiny neurons: studies in vivo and in vitro. Neuroscience 79:509–516. (1994) Targeted disruption of the BDNF gene perturbs brain and sensory neuron development but not motor neuron development. Cell 76:989–999. (1996) Development of striatal dopaminergic function. III. Pre- and postnatal development of striatal and cortical mRNAs for the neurotrophin receptors trkB and trkC and their regulation by synaptic dopamine. Dev Brain Res 94:133–143. (1993) The cAMP response element binding protein interacts, but Fos protein does not interact, with the proenkephalin enhancer in rat striatum. Proc Natl Acad Sci USA 90:7005–7009. (1998) Impaired locomotion and dopamine signaling in retinoid receptor mutant mice. Science 279:863–867. (1989) ARPP-21, a cyclic AMP-regulated phosphoprotein enriched in dopamine-innervated brain regions. II. Molecular cloning and nucleotide sequence. J Neurosci 9:3638–3644. (1986) Prenatal ontogeny of the GABAergic system in the rat brain: an immunocytochemical study. Neuroscience 19:465–493. (1992) Heterogeneous development of calbindin-D28K expression in the striatal matrix. Neuroscience 320:304–322. (1998) Basal ganglia precursors found in aggregates following embryonic transplantation adopt a striatal phenotype in heterotopic locations. Development 125:2847–2855. (1993) Neuronal colocalization of mRNAs for neurotrophins and their receptors in the developing central nervous system suggests a potential for autocrine interactions. Proc Natl Acad Sci USA 90:6439–6443. (1994) BDNF promotes differentiation of striatal GABAergic neurons. Dev Biol 165:243–256. (1998) Granule neuron regulation of Purkinje cell development: striking a balance between neurotrophin and glutamate signaling. J Neurosci 18:3563–3573. (1994a) Platelet-derived growth factor exerts trophic effects on rat striatal DARPP-32-containing neurons in culture. Exp Brain Res 101:291–296. (1994b) Selective sub-dissection of the striatal primordium for cultures affects the yield of DARPP-32-containing neurones. NeuroReport 5:1081–1084. (1995) Trophic and protective actions of brain-derived neurotrophic factor on striatal DARPP-32-containing neurons in vitro. Dev Brain Res 90:92–101. (1996a) DARPP-32-rich zones in grafts of lateral ganglionic eminence govern the extent of functional recovery in skilled paw reaching in an animal model of Huntington’s disease. Neuroscience 74:959–970. (1996b) Differential trophic effects of basic fibroblast growth factor, insulin-like growth factor-1, and neurotrophin-3 on striatal neurons in culture. Exp Neurol 138:144–157. (1992) Dopaminergic stimulation upregulated the in vivo expression of brain-derived neurotrophic factor (BDNF) in the striatum. FEBS Lett 313:138–142. (1995) Projection neurons in fetal striatal transplants are predominantly derived from the lateral ganglionic eminence. Neuroscience 69:1169–1182. (1998) Early specification of striatal projection neurons and interneuronal subtypes in the lateral and medial ganglionic eminence. Neuroscience 84:867–876. (1989) ARPP-21, a cyclic AMP-regulated phosphoprotein enriched in dopamine-innervated brain regions. II. Immunocytochemical localization in rat brain. J Neurosci 9:865–875. (1998) Quantitative immunocytochemistry of DARPP-32-expressing neurons in the rat caudatoputamen. Brain Res 808:8–12. (1996) Comparative study of brain-derived neurotrophic factor messenger RNA and protein at the cellular level suggests multiple roles in hippocampus, striatum, and cortex. Neuroscience 74:161–183. (1996) Intracellular signaling pathways activated by neurotrophic factors. Annu Rev Neurosci 19:463–489. (1998) The sequence of formation and development of corticostriate connections in mice. Dev Neurosci 20:98–112. (1990) The neural network of the basal ganglia as revealed by the study of synaptic connections of identified neurons. Trends Neurosci 13:259–265. (1995) Neurotrophins and neuronal plasticity. Science 270:593–598. (1993) Dopamine D1 agonist SKF 38393 increases the state of phosphorylation of ARPP-21 in substantia nigra. J Neurochem 60:1043–1046. (1998) Retinoic acid regulates the developmental expression of dopamine D2 receptor in rat striatal primary cultures. J Neurochem 71:929–936. (1987) Neuronal birthdate underlies the development of striatal compartments. Brain Res 401:155–161. (1995) The neurotrophins BDNF, NT-3, and NT-4/5 promote survival and morphological and biochemical differentiation of striatal neurons in vitro. Eur J Neurosci 7:213–222. (1989) Intrinsic organization and connectivity of intrastriatal striatal transplants in rats as revealed by DARPP-32 immunohistochemistry: specificity of connections with the lesioned host brain. Eur J Neurosci 1:690–701. (1994) Neurotrophin-4/5 promotes survival and differentiation of rat striatal neurons developing in culture. Eur J Neurosci 6:1669–1679. (1994) Dopamine D1 receptor mutant mice are deficient in striatal expression of dynorphin and in dopamine-mediated behavioral responses. Cell 79:729–742.